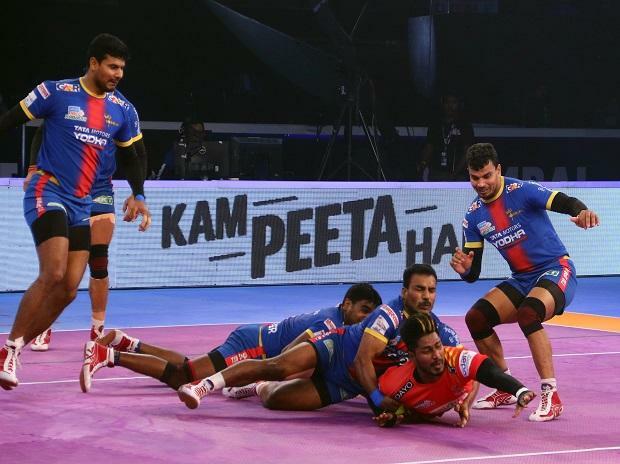 In Qualifier 2 of VIVO Pro Kabaddi season six (PKL 2018), Gujarat Fortunegiants produced an impressive performance as they beat UP Yoddha 38-31 to enter the final of Pro Kabaddi 2018. Sachin was the star for Gujarat as he scored 10 points and got ample support from his defence. For UP Yoddha Nitesh Kumar scored 6 tackle points and became the first defender in the history of Pro Kabaddi League to score 100 tackle points in a single season. His fine effort went in vain as UP Yoddha raiders couldn’t produce enough points and crashed out of Pro Kabaddi 2018. Prashanth Kumar Rai made a two-point raid in the first minute to give UP Yoddha 2-1 lead. Sachin responded with a two-point raid for Gujarat Fortunegiants to give his team 4-2 lead. No tackle point was scored in the first five minutes as both teams were level at 5-5. Prapanjan got into the act as he made a two-point raid in the 8th minute as Gujarat Fortunegiants opened a four-point lead. Nitesh Kumar made a couple of successful tackles for UP Yoddha as they came back to level the match at 11-11 in the 15th minute. 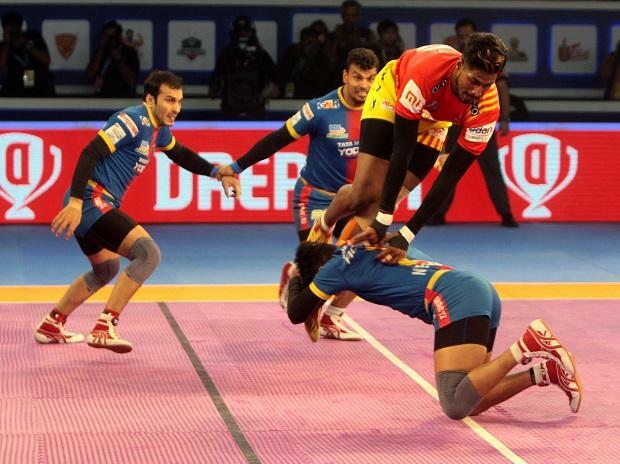 Gujarat Fortunegiants inflicted the first all out of the match to lead 19-14. Gujarat Fortunegiants started the second half in an impressive fashion as Sachin and Prapanjan picked up the raid points. In the first 8 minutes of the second half Gujarat didn’t let UP score a single point as they went on a 10-point run to lead 29-14. This included an all-out which was inflicted in the 27th minute. Shrikant Jadhav tried to ignite UP Yoddha’s hopes of a comeback with a couple of successful raids. In the 36th minute UP Yoddha trailed by five points but Gujarat Fortunegiants showed calm and composure to secure a place in the final.